The Peugeot 108 has been awarded a near top score of nine out of ten in Reevoo, based on 900 reviews of the city car range. ‘Deceptively spacious inside’, ‘Fantastic car’, ‘Smooth drive’ and ‘looks amazing’ are just some of the comments left by Peugeot customers on the Reevoo site. 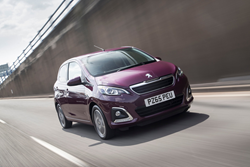 Peugeot’s ultimate city car, the compact and agile Peugeot 108, has proved a hit with Peugeot customers since its launch in 2014. The nippy car that’s full on character has been awarded a near top score of nine out of ten in Reevoo, based on 900 reviews of the city car range. The Peugeot 108, noted for its personalisation themes, iTop models and innovative Open & Go system, scored top points for being fun to drive, practicality, fuel efficiency and good value for money on the Reevoo scoreboard. Designed to make city driving more fun, the Peugeot 108 is available in an expanded palette of vibrant exterior colours. Contrasting roof colours, body decals and interior detailing ensure this car truly reflects its driver’s personality. In addition to being fashionable and fun, driver comfort is also top of the list of Peugeot 108 highlights, with an advanced infotainment system featuring a 7-inch touch-screen display. Meanwhile, the 108’s PureTech 3-cylinder petrol engine provides excellent fuel economy and is low on CO2 emissions, keeping city driving cost effective and clean. Tennis enthusiasts love the 108 TOP! Roland Garros special edition, sold in Diamond White or Raven Black metallic, with distinctive Roland Garros branding and orange coloured door mirrors. Those wanting a sporty edge to their city commute will welcome the new GT line when announced, joining the Peugeot 108. Independent review site Reevoo provides unbiased customer reviews of products and services across the world. Established in the UK in 2005, Reevoo is now available in 60 countries and in 30 different languages. All Reevoo reviews are accurate and verified, and provide an unedited assessment of what it is really like to drive a Peugeot 108. The UK is the third largest market for PEUGEOT with its UK Headquarters located in Coventry. The UK car line-up includes the 108, 208, 308, 508, 2008, 3008 and 5008 supplemented by people-carriers and a four-model van range that includes the Bipper, Partner, Expert and Boxer.